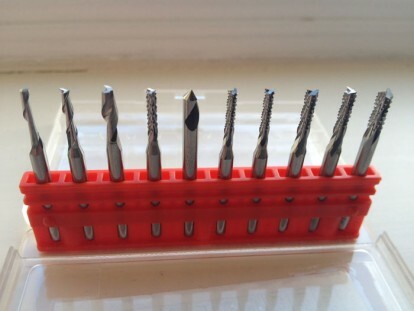 Set of 10 solid carbide milling bits of various sizes, suitable for various materials. With 1/8" diameter shafts. What are the feed and speed rates for these tools please? There are no set speeds/feeds provided for these tools. Depending on the materials you will reduce or increase feed rates and also the depth per pass. For example for wood you might feed at 10-20 mm/s at a depth of 3 mm per pass (3mm cutter diameter). For metal you might feed at 3-5 mm/s at a depth of 0.5 - 1 mm per pass. Generally for small tools like these, they are more fragile and can snap (carbide is brittle). This is good when starting out as you can play with these low cost tools and get a feeling for limits of loads on your tools for given feeds/speeds and materials. If you use larger tooling you will be able to cut deeper with higher feed rates. A rule of thumb when starting out (and cutting medium density materials like wood) is that you generally would not cut deeper in one pass than the diameter of the cutting tool and plunge rates (feed down in Z) should be no more than 1/2 of whatever the comfortable feed rate is. The tougher the material, the less you cut per pass and the lower the feed rate you set. The lighter the material e.g. foams, then the more you can cut per pass and the higher your feed rate can be. Remember that you do not have a 2 ton industrial CNC machine with industrial spindle, so theoretical feeds/speeds rates given in online calculators may not be achievable and you should generally be conservative in your feeds/speeds when trialling now tools/materials. You will quickly learn to understand the sound that the tool makes when cutting the material which gives you feedback on how well it is cutting. Also by inspecting the cut surfaces, you can gain feedback on how well it is cutting. You will soon get an understanding of what feeds and speeds work for the tools that you are using on your preferred materials and then will likely stick to those speeds/feeds going forward.